California’s central coast is flush with wineries these days. The Monterey and Carmel Valleys both have dozens of wineries that are taking advantage of the fertile land to grow grapes for their premium wines. Knowing this about the area, we were eager to visit for a wine tasting weekend in Carmel-by-the-Sea. For weekend wine tasters like us, this small town is the perfect place to taste the wines of the Monterey and Carmel Valleys. Getting to Carmel-by-the-Sea is super easy. We flew into San Jose International Airport and within 20 minutes of landing we were in our rental car headed south. I’ve never had that smooth of a transition from plane to driving before. Carmel-by-the-Sea is located just a couple hours to the south, right on the ocean. Carmel-by-the-Sea is a small European-style village that is well loved and maintained by the community. They don’t allow big-box stores or chain hotels, so wherever you choose to stay will be a locally owned inn. (See below for all our hotel recommendations). If you’re in town for a wine tasting weekend, you absolutely must pick up a Wine Walk Passport from the Carmel Chamber of Commerce. For $65, you receive 9 passes and a mini-winery map. You can use those 9 passes for a special tasting flight at any of the 14 wineries in town. The passes never expire, so you can use them all at once, or save them for your next visit. We opted to share a passport, which meant we could split the 9 tickets or share a tasting at each winery. We did a little of both. The best part about Carmel-by-the-Sea is that everything is within walking distance. We parked our car when we arrive on Saturday and didn’t get back in it until we left town. The Hofsas House was only a few blocks from the main part of town, where all of the tasting rooms are located, so it’s a very convenient place to stay for a wine tasting weekend in Carmel-by-the-Sea. As soon as you walk into the center of town, you’ll see how extremely easy it is to get around to all the tasting rooms. Sometimes there are multiple tasting rooms on one block. None of them are more than a few blocks away. Spread out in between tasting rooms are tons of fantastic restaurants, bars and cafes. You won’t find any Starbucks Coffee on offer in Carmel-by-the-Sea. Instead, there are many cute and cozy coffeehouses to visit. As mentioned, there are 14 wine tasting rooms in town. For a list of them all, check out the Chamber’s wine walk passport page, where you’ll also find all the information you’ll need to enjoy a wine weekend in Carmel-by-the-Sea. In two days, we were able to visit eight of them. Of those eight, here are a few we liked best and would highly recommend visiting. Run by the Smith family of Paraiso Vineyards in the Santa Lucia Highlands, Alexander-Smith winery has a small, but beautifully designed space tucked in a peaceful courtyard. We pulled up a couple stools and tried a few of their signature wines, including a Reisling and a Zinfandel, which were both a welcomed change from the Pinor Noir and Chardonnay that is most typical of the area. There are few tasting rooms that are open late in town, and we loved it that one of them was Vino Napoli, an Italian eatery/wine bar, where we could get a late-night pizza, while also sipping on a few of the featured Pèpe Winery wines. The pizza was outstanding. And there were lots of other snacks and wine flights to choose from. There are three wine rooms located right next door to each other, including Manzoni Cellars. It’s a small space, but with a lot of character. We pulled up stools to the elaborately carved wooden bar and had a fantastic time talking with the wine pourer about the wines and the vineyard/winery located about an hour south in the the heart of the Santa Lucia Highlands. We absolutely fell in love with the Syrah and Zinfandel. A definitely must-visit on your wine walk. The only place in town where we found sparkling wines was Caraccioli Cellars, which also happens to be one of the tasting rooms that’s open late on the weekends. It felt more like a regular bar than a wine tasting room with its dark wood and dimmed lights. We could have sat there for hours enjoying the wine. In between wine tastings, we also tried out a few great restaurants. I would return again to all of these restaurants. The food was great at each. Mundaka serves Spanish tapas – and some of my favorites, like pulpo and patatas bravas. The service was outstanding – especially from the owner who had a great sense of humor. Cantinetta Luca is a busy little Italian eatery with rustic, homemade favorites like burrata with crostini, heaping bowls of pasta, and hand-tossed pizza from the wood-fired oven. You can even sit at the pizza counter and watch the tossing of the dough. Little Napoli is a full-service Italian restaurant attached to Vina Napoli. Their pizza takes first place for me. It’s a pretty good facsimile to true Napoli pizza. They also have a little outdoor patio with music playing where you can enjoy your meal. As you can see, we thoroughly enjoyed our wine tasting weekend in Carmel-by-the-Sea. We even had time to spend discovering the surrounding area. Just a few blocks down away is the beautiful and expansive Carmel Beach. Monterey and its famous Cannery Row is only a 15-minute drive, or you can take the 17-Mile Drive scenic route that takes a bit longer, but winds along the beautiful coastline with stops at major sightseeing areas along the way. As I mentioned earlier, there are no big chain hotels in Carmel, though there are a few brands you will recognize, which provide a boutique experience. The town really prides themselves on remaining as local as possible, when it comes to stores and hotels. If you’re traveling with a dog, you’ll be happy to hear that many properties are dog-friendly. That’s another thing you’ll quickly learn about Carmel. Everyone has a dog and they are welcomed most everywhere. If you’re allergic or don’t want to deal with the noise that comes along with dogs on the property, make sure you check with the hotel before booking. Have you ever been to Carmel-by-the-Sea for a wine tasting weekend? What are your favorite things to do there? Share your thoughts with us in the comments. 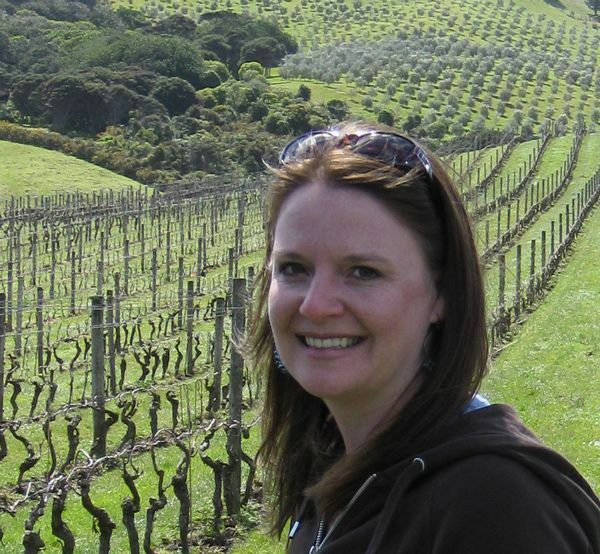 This entry was posted in Wine and tagged California, wine, wine tasting. Be sure to visit Tudor Wines in the Court of the Fountains at Mission and 7th, Carmel by the Sea. You can even stay at the Tudor room at the Vendange Inn! Tudor Wines is the Premier Tasting venue in Carmel and the only place that’s both dog friendly and where you can dine while tasting 90+ point Santa Lucia Highlands and Monterey county pinot and Rieslings. Fantastic, Dan. Thank you for adding that information. I’ve never visited Carmel, though I’ve only heard great things about the town. I love places that are devoid of large hotel chains and eye-sore tourist establishments. It seems like the Wind Walk Passport is a must for those who love wine tasting! I do too. It doesn’t detract from the character of small towns. This is a dream, I’ve always wondered how to execute wine tasting when you need to drive – no need here! Love a family run business too, very appealing. Smaller towns with wine tasting rooms are definitely the way to go. Like Walla Walla and Woodinville in Washington! Laura, this looks amazing. Wrath, with it’s wine (and cheese next door) would be great and then there is Napoli and the ones that have pizza as well as wine. I really like the idea of the wine passport and the 9 tickets for the wine flights. This is a great idea. I think the biggest thing about this location is that it has encouraged me to think about LA as a stopping point (rather than a transit) so that I can get out ans explore more fully these nearby locations. Carmel is a bit of a trek from LA, but it would be worth it, if you have the time. There are some really great short trip places in California. I know. We never stop! This is my kind of weekend escape! Wine, wonderful looking food and the BEACH!! All my favourites rolled into one. The Wine Walk Passport sounds like an amazing idea and great value for tasting at 9 wineries! Even better that you don’t need to drive! Wine, Pizza and the beach – what more could you want from a weekend away?! Right?! I think it’s always a good idea for a place with a lot of wineries like this to offer a passport for wine tasting. It encourages you to try more and it’s super convenient. You just game me a great idea. I’m headed to Carmel next month and I could do a little wine tasting there. I’ve been in Carmel so many times before, but was always more interested in their restaurants and their fancy boutiques. That quaint little town is the jewel of the Pacific Coast. It really is a jewel. I think you’ll find that wine tasting there is really fun too! Wine tasting is one of my favorite activities 😉 Great post, thanks for sharing! Wow. Your incredible photos really make this look like something we should really put on our shortlist of road trip ideas. Oh, you absolutely should! It’s beautiful there. Perfect for a road trip. With a love for wine and trips to ocean, this looks pretty much perfect. Thanks for all the information and great photos. Makes it hard not to want to go. If you love those two things, you’ll be in heaven in Carmel by the Sea. It’s such a wonderful place.